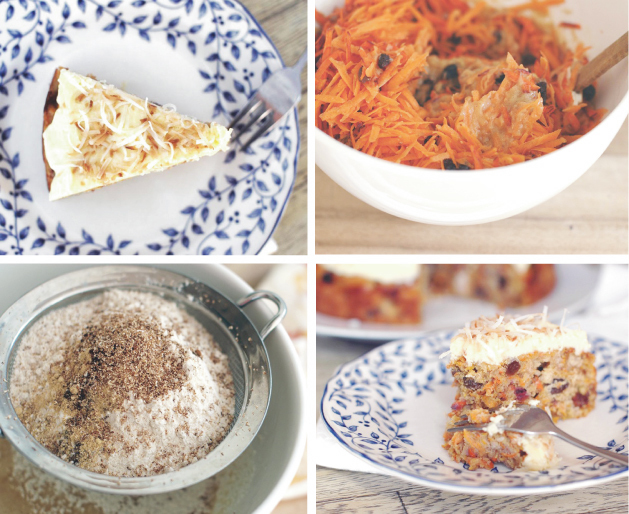 Carrots make up a substantial component of the ingredients in this cake so not only is it relatively healthy as far as cakes go, it’s also an easy to make, being near impossible to over-mix or over-bake! Studded with walnuts and sultanas and fragrant with spices, this wholesome Carrot Cake makes a lovely afternoon tea or birthday treat. 1. Preheat oven 180°C. Lightly grease a 20 cm cake pan and line with baking paper. 2. In a large mixing bowl whisk together the eggs and sugar until creamy, then whisk in the oil until it is well combined. 3. Sift the flour, salt, baking powder, bicarbonate soda and spices evenly over the wet mix and fold them through. Then add the carrots, walnuts and sultanas and keep on folding together until everything is well combined. 4. Tip the batter into the prepared pan and roughly flatten the surface. Bake for 40-50 minutes, rotating pan midway through. Check whether the cake is ready by tapping lightly in the centre: it will spring back rather than collapse when done. Note that the cooking time will vary according to the moisture content in the carrots. 5. Cool in the tin for 15 minutes then turn onto a wire rack and cool completely. 6. To make icing beat the butter with a wooden spoon until creamy. Sift over the icing sugar and beat until it’s well combined. Add vanilla and quark and beat them in too. 7. Use a pallet knife or spatula to spread the icing over the top of the cake and finish with the coconut.